A-10 Thunderbolt II wallpapers for your PC, Android Device, Iphone or Tablet PC. 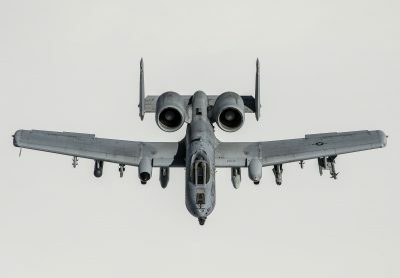 If you want to download A-10 Thunderbolt II High Quality wallpapers for your desktop, please download this wallpapers above and click «set as desktop background». You can share this wallpaper in social networks, we will be very grateful to you. 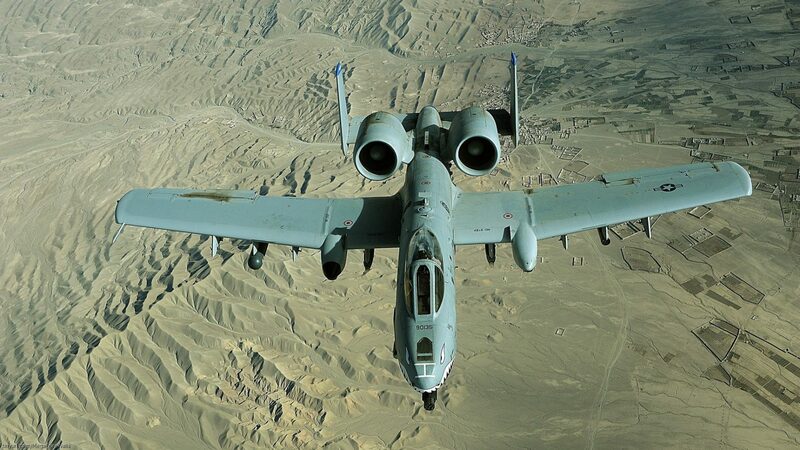 A-10 Thunderbolt II – is an American armored attack aircraft, the main purpose of which is to combat the enemy’s armored vehicles, as well as the destruction of various ground targets. It received its name in honor of the fighter-bomber of the Second World War P-47 Thunderbolt, which was a real headache for German tankers on the Western Front. 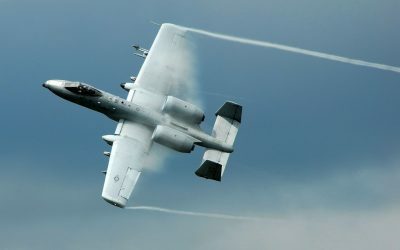 After their appearance in the US Air Force, the aircraft was treated for a long time without due respect, regarding it as an “ugly duckling”. This was due not only to its limited use, but also to the appearance of the car. 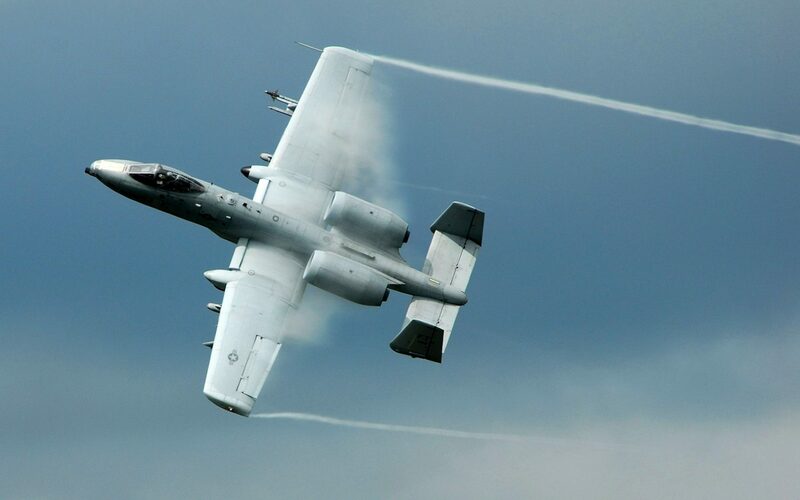 The A-10 aircraft even got the nickname Warthog (Warthog) for its appearance. At one time, the military even thought about replacing it, but the use of the machine that had suddenly become successful during the Gulf War put an end to all disputes, the plane actually managed to prove its importance and necessity. 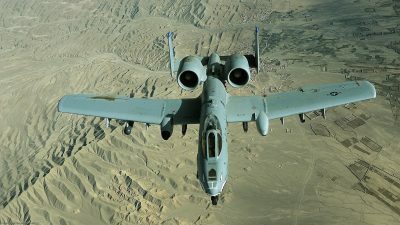 A-10 Thunderbolt II was the first American aircraft, which was designed specifically to solve the problems of direct aviation support for ground units. Development of the aircraft began in 1967. 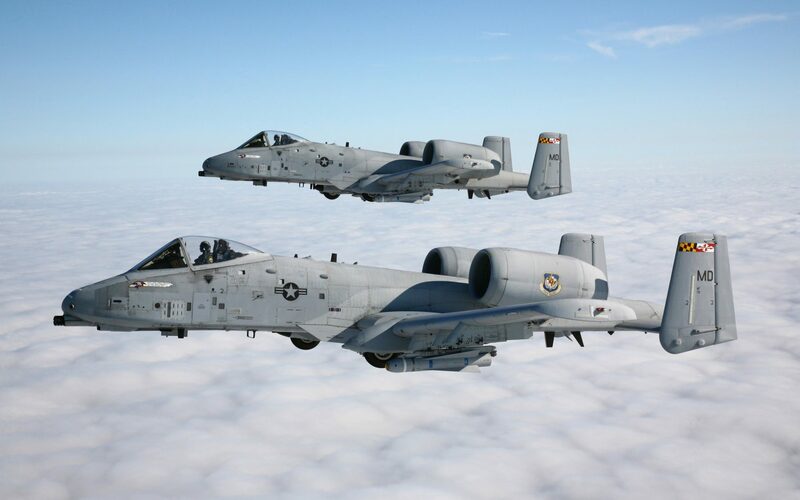 Attack aircraft specially designed for combat at low altitudes and speeds with high precision weapons. The first Thunderbolt took off on February 15, 1972, followed by a contract to build 6 such machines for comprehensive flight tests. 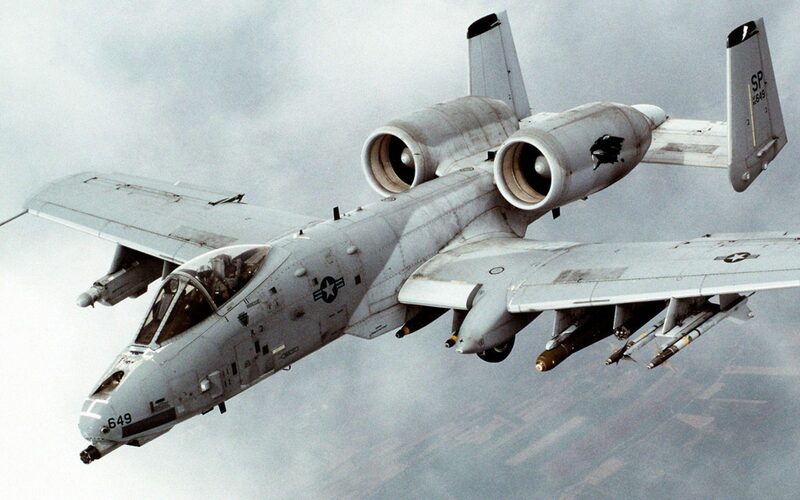 The first serial attack A-10 took to the air as early as October 1975. 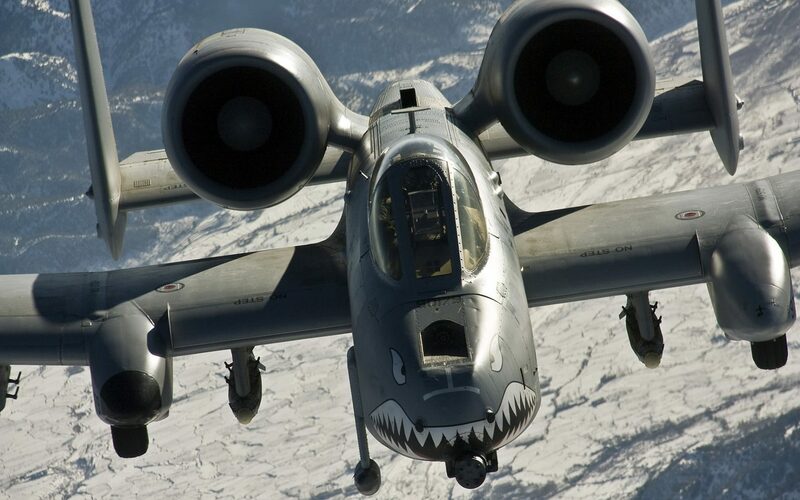 The main task of the created attack aircraft was the hunt for enemy tanks on the battlefield. High maneuverability at low altitudes provided the vehicle with the possibility of evading anti-aircraft missiles and enemy fighter attacks. 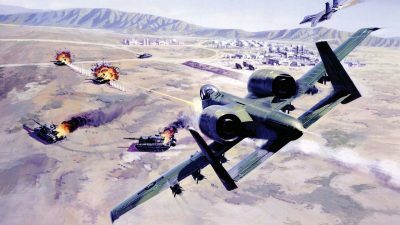 Good maneuvering characteristics and a view from the cockpit, a relatively low speed of flight, allowed the attack aircraft to hit even relatively small targets with 1 approach. Shooting from a cannon at targets such as a tank was carried out from a height of 100-150 meters and could be fired from a distance of 1,800 meters; at targets that do not have armor, fire could open from 3,000 to 3,600 meters. At the time of its creation, the A-10 Thunderbolt II significantly exceeded all other attack aircraft in terms of its security level. 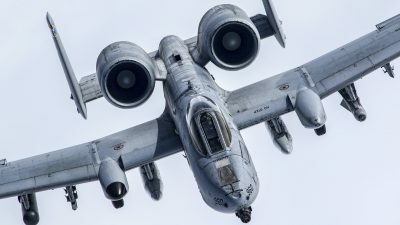 1309 kilograms of armor reliably covered the vital elements of the aircraft’s design and the pilot from small arms fire, and also ensured the machine’s survivability when hit by small-caliber anti-aircraft artillery shells (20-23 mm.). 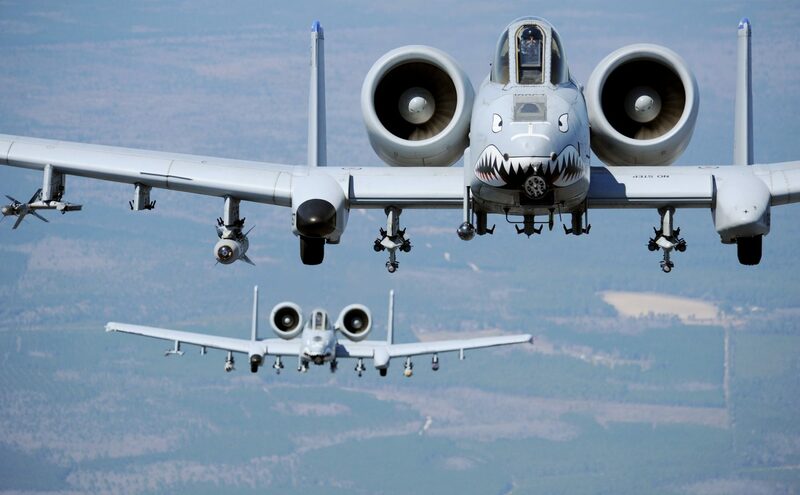 Aircraft A-10 is a cantilever all-metal nizkoplan, having two-tail fin and tricycle landing gear. Two General Electric TF34-GE-100 turboprop engines are located in the nacelle on both sides of the rear fuselage. The closed cockpit is located far in front of the wing and is equipped with the possibility of ejection at zero height and zero speed. The cockpit has a reservation and is made in the form of a bathtub, which is assembled from titanium armor plates fastened with screws. Reservations are able to protect the pilot from shells of a caliber of up to 23 mm. The cabin’s glazing is made of bulletproof glass. Two turbofan engines TF34-GE-100 have a load of 4,100 kgf (each). The unusual location of the aircraft engines was due to the desire of designers to prevent foreign objects from entering them during the operation of the aircraft in the field, as well as to provide easy access for mechanics to carry out maintenance and minor repairs. In addition, this location of the engines gave them additional protection from fire from the ground, since the engines were protected by tail and planes. The maximum speed of the aircraft is 834 km / h, on the ground – 706 km / h, cruising speed – 623 km / h.
The wing of the aircraft has a large enough area and allows the attack aircraft to maneuver over the battlefield at low speeds and at the same time carry a large payload. The maximum combat load of the machine is 7260 kg. Maximum take-off weight is 22,680 kg. The survivability of the aircraft was increased through the use of special armor protection control systems attack aircraft, self-tightening pipelines to the engine and fuel tanks. 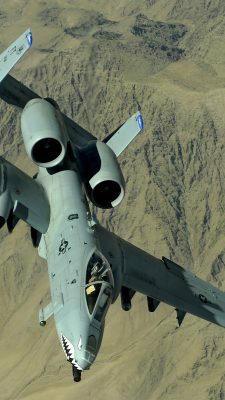 In addition, the A-10 Thunderbolt II control system has dual redundancy hydraulic systems, as well as additional manual control. The seven-barreled gun GAU-81A (caliber 30 mm, ammunition 1174 shells, rate of fire 2100-2400 rds / min) is used as artillery armament. The fire is fired by shells with shells made of aluminum alloys. The recoil force of an artillery installation is 7,140 kgf., With the location of the gun close to the axis of attack of the attack aircraft, it was possible to significantly reduce the drop-in time during firing. Also eliminating this effect contributes to the automatic deflection of the elevator down by 0.5 during firing. Free-falling bombs (up to 28 Mk.82 ammunition with a caliber of 225 kg or up to 6 Mk.84 with a caliber of 900 kg), one-time bomb cassettes of “Rokai” (up to 20) or CBU-52/58/71 (up to 16), incendiary bombs BLU-16 or BLU-27 (up to 6). The controlled armament of the aircraft is represented by AGM-65A and AGM-65B missiles (6 pieces) of Maverick, which have a television shot-out homing on the principle of “fired and forgotten”. The detection of the optically contrasting target is carried out by the homing head of the rocket, which is fixed on the suspension of the attack aircraft. Theoretically, target detection is possible at a distance of up to 11-13 km., But in real combat conditions, as a rule, the detection range is 4-6 km. (this is due to smoke over the battlefield, weather conditions, etc.). The resulting television picture is reproduced on the screen in the cockpit. After manual tracking of the target for 4-8 seconds, the homing head of the rocket is “locked” on the target, switching to the homing mode, after which a launch occurs. Also, the A-10 Thunderbolt II can be equipped with an AGM-65D SD, which is similar to other Maverick missiles, but differs from them by the presence of a thermal imaging homing system, which ensures the destruction of ground targets at night. 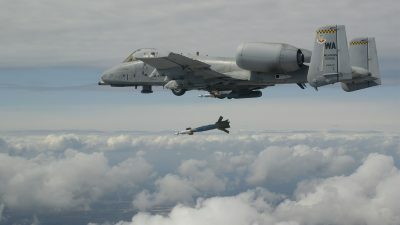 As self-defense attack aircraft can use air-to-air missiles AIM-9 “Sidewinder”, which are located on the extreme wing nodes of the suspension. It is also possible to install 2 gun containers SUU-23 (with six-barrel automatic guns “Volcano” of 20 mm caliber. ), Containers with dipole reflectors Trekor ALE-40 (480 cartridges) or with IR traps, special containers with equipment for setting active interference radar enemy AN / ALQ-119 or 3 additional fuel tanks of 2,270 liters each. 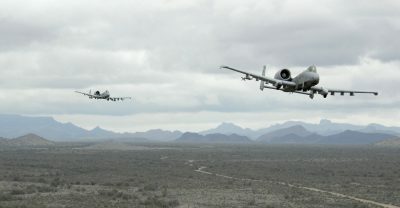 The first combat use of the A-10 Thunderbolt II attack aircraft occurred in 1991 during Operation Storm in the Desert. In total, in this operation, the US Air Force engaged 144 attack aircraft A-10, which made 8100 sorties. In this case, 7 attack aircraft were lost (on average, 1 loss per 1,350 sorties). To the surprise of many observers, the seemingly outwardly attack aircraft became the real “hero” of this campaign, along with the F-117 stealth fighter aircraft and the F-15 fighter. 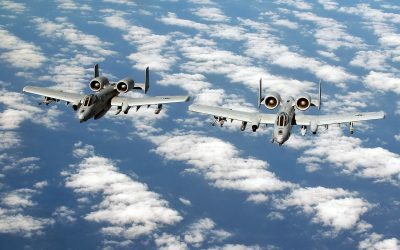 According to the US military during the operation “Thunderbolts” destroyed more than 1,000 Iraqi tanks (more than any other aircraft participating in the operation), as well as 2,000 units of other military equipment and about 1,200 artillery pieces. 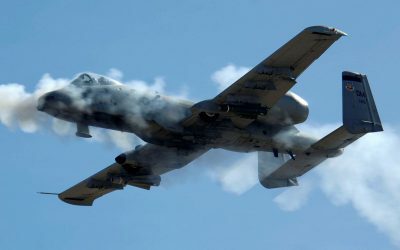 Even if we take into account that the assessments of the damage suffered by the Iraqi army were overestimated, the A-10 still proved to be the most efficient aircraft in this war, surpassing even the AN-64 Apache anti-tank helicopter. The level of combat readiness of the aircraft during the operation was 95.7%, which also turned out to be a record among all tactical aircraft of the US Air Force. In one of the sorties, a pair of A-10 Thunderbolt II attack aircraft managed to destroy 23 Iraqi tanks and damaged 10 more. During the hunt for the Scud launch systems, the A-10 Thunderbolt II tactical missiles showed their effectiveness, destroying 6 in one night stationary, 3 mobile and 3 temporary launchers. Also during the fighting, attack aircraft shot down 2 Iraqi helicopters: Mi-8 and presumably MBB Bo 105. In addition, during the operation “Desert Storm”, the survivability of the attack aircraft was proved for the first time. 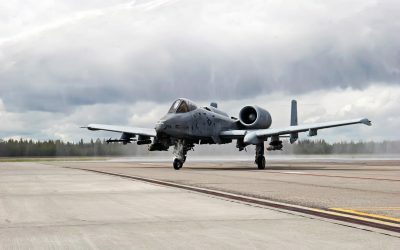 According to aviation technicians, no other aircraft could have returned to the base with the same damage that was recorded on the A-10. The only weak point of the machine within the framework of this operation can be recognized as its tendency to episodes with “friendly fire”, which later manifested itself in other conflicts. This was caused primarily by the very specifics of using the machine, which always worked in close proximity to its troops. At the end of January, during the battle for Ras al-Khafji, the A-10 Thunderbolt II attacked the US Marine LAV-25 APC LAV-25 missile with a Maverick missile, as a result of the APC was destroyed, 7 people were killed. A month later, A-10 attacked the British BMP as a result of which nine British were killed. A-10 attack aircraft took part in the NATO military operation against the Federal Republic of Yugoslavia in 1999, taking off from air bases in Italy. According to official information during the conflict, these aircraft did not suffer losses. 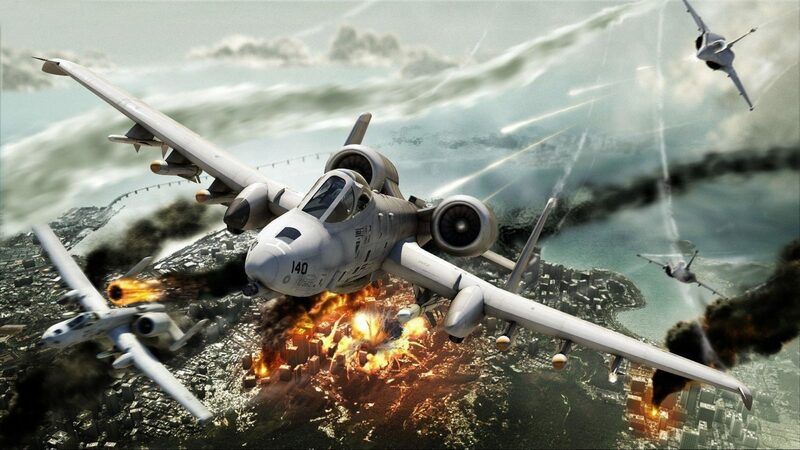 At the same time, the high survivability of the aircraft was confirmed. 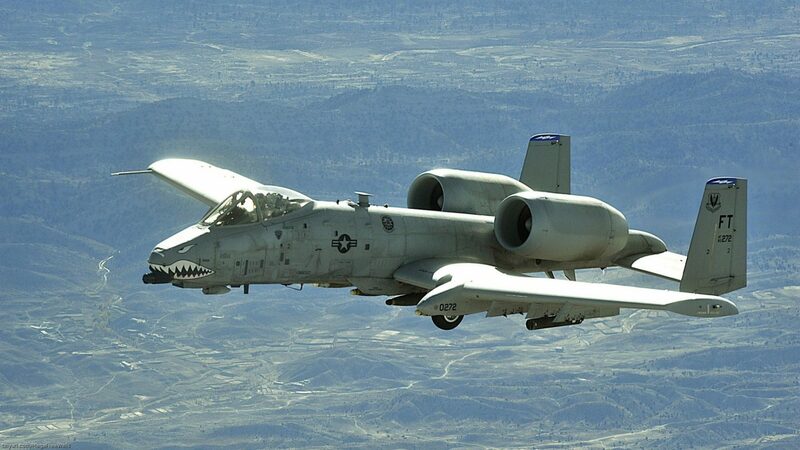 On 2 May 1999, an A-10 Thunderbolt II aircraft crash landed at Skopje Airport in Macedonia. The car was completely shot off by one engine, later this engine was shown on Yugoslav TV. 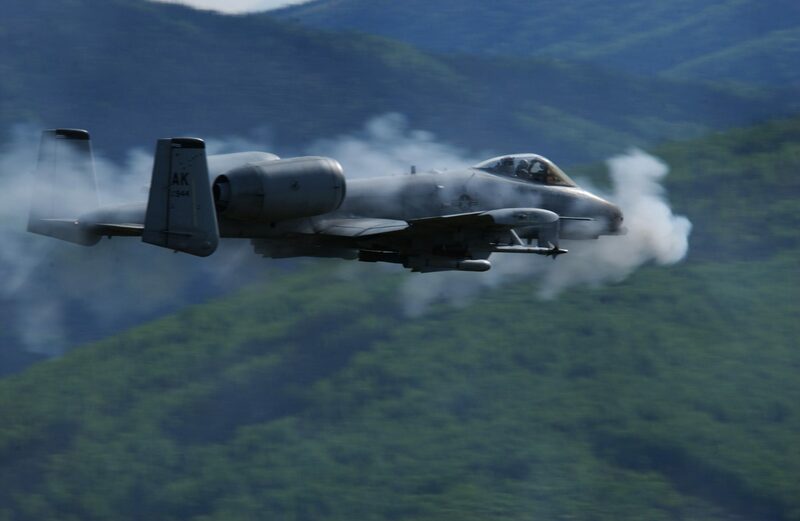 The consequences of using an attack aircraft in the Balkans manifested themselves in 2001, when a scandal erupted around the world of shells with uranium cores used by Americans. 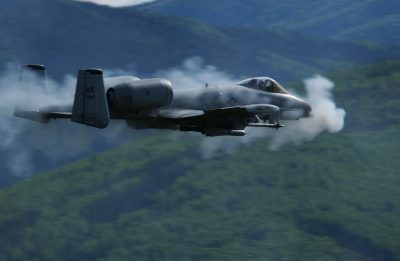 It turned out that the A-10 attack planes fired over 30,000 such projectiles over Kosovo. A number of assumptions were expressed that these shells could pose a real threat to the American soldiers stationed in Kosovo and the NATO military. 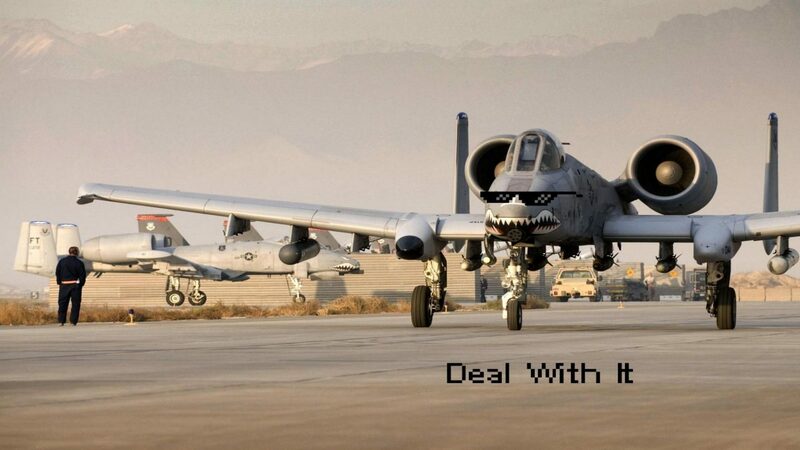 Subsequently, the attack aircraft took part in the NATO operation in Afghanistan in 2001, and then in Iraq in 2003. 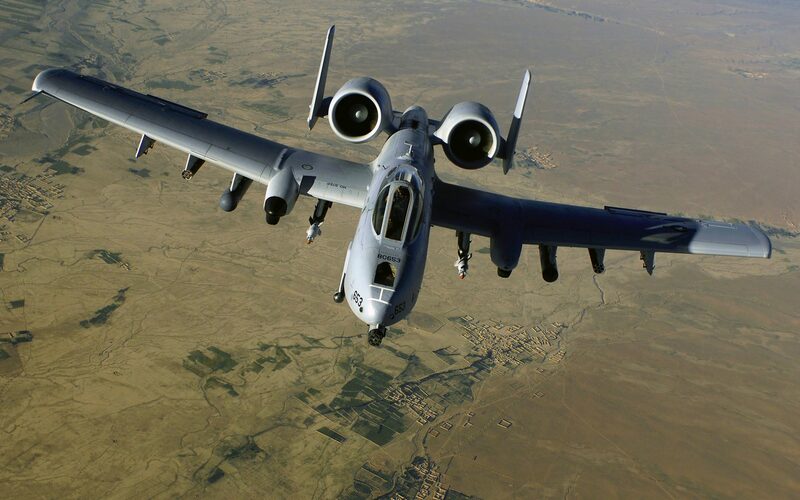 In Operation Freedom to Iraq, which took place in March-April 2003, 60 A-10 attack aircraft were deployed. During the operation, one plane was shot down on April 7 by Iraqi air defense in the area of ​​the Baghdad airport. Another aircraft under the control of a female pilot, Kim Campbell, suffered serious damage (hydraulic system failure, one engine was damaged, hundreds of holes in the fuselage, the wing and the tail of the machine), but was able to reach the home airfield. 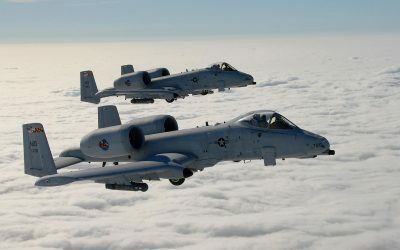 After the completion of the active phase of hostilities and the beginning of the partisan war, the A-10 aircraft continued their combat sorties.